Earlier this month, President Barack Obama mentioned that he is a fan of microbrew beers, and that he had purchased a beer-making kit for the White House. The Washington Post reported that the president's kitchen staff has home-brewed three varieties of beer so far: White House Honey Ale, White House Honey Blonde Ale and White House Honey Porter, all of which include honey from the first lady's "kitchen garden." On Thursday, White House Press Secretary Jay Carney was asked by a reporter if the White House would release the "secret beer recipe," and he responded that he was "not aware of any plans at this time to divulge the secret recipe." This governmental stonewalling is not going over well with microbrew beer geeks aficionados, however, and they are now using any and all means at their disposal to try to get at this state secret. Following in the footsteps of great men like George Washington, Thomas Jefferson, and Benjamin Franklin, Barack Obama has reportedly been enjoying the rewards of home brewed beer. Recent reports from news outlets like the Washington Post (August 15th, 2012) have stated that Obama has been drinking a White House home brew Honey Ale while on the campaign trail. In keeping with the brewing traditions of the founding fathers, homebrewers across America call on the Obama Administration to release the recipe for the White House home brew so that it may be enjoyed by all. To be reviewed by the White House, the petition must receive 25,000 online signatures. As of 12 p.m. today, it still had only had 4,879 signatures, so the petition route to obtaining the beer recipe may not work. However, another beer-lover has now filed a Freedom of Information Act request with the government seeking disclosure of the recipe. 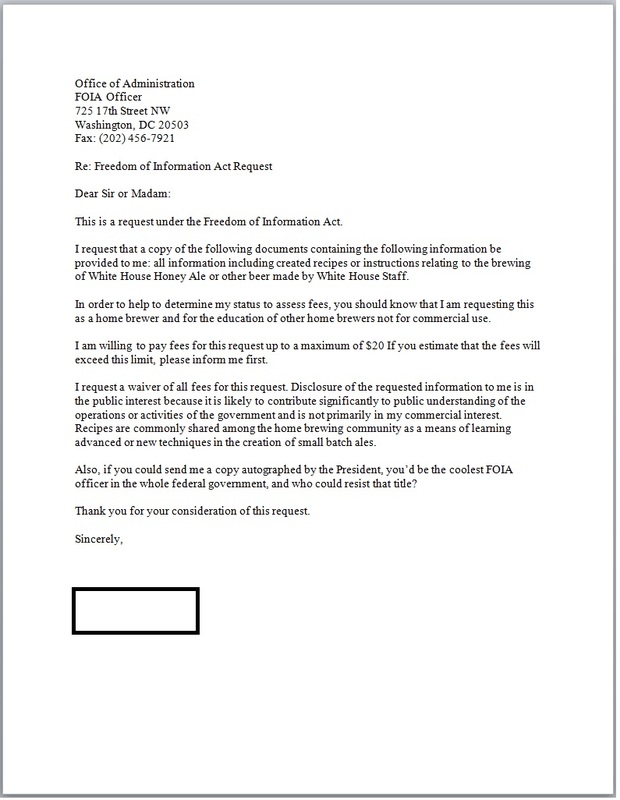 On Wednesday, a FOIA request was filed seeking "all information including created recipes or instructions relating to the brewing of White House Honey Ale or other beer made by White House staff." Alas, this tactic may also fail, as White House documents are reportedly not subject to the Freedom of Information Act. D'oh!! Late Thursday night, however, Carney indicated that the White House had reversed its position on releasing the recipe. "If it reaches the threshold, we'll release it," Carney tweeted, referring to the 25,000 signatures required for the online petition. So beer-lovers who want the secret White House Honey Ale recipe need to go sign the petition ASAP, or forever hold their peace.